Convenient, portable mutli-surface wipes to fight lurking germs. Is the Germwar Disinfecting Wipes - 80 Count Right for me? Whether at work, the gym, grocery store or home, germs can lurk causing you to get sick. 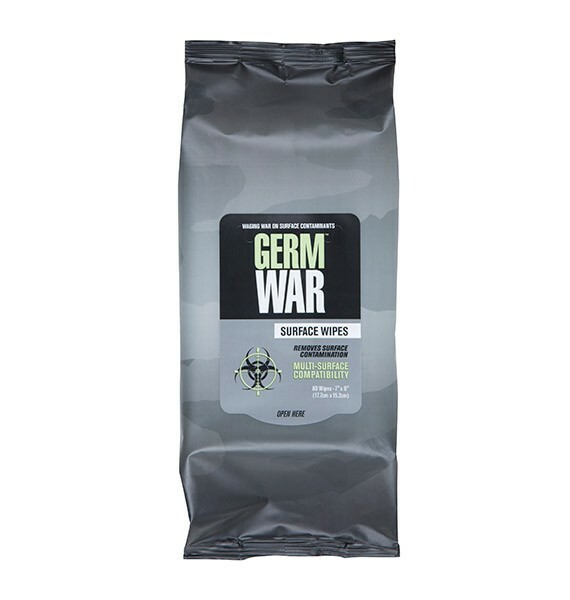 With the convenient and portable multi-surface wipes, GermWar Disinfecting Wipes kill 99.9% of germs in one wipe. You no longer need to worry about messes, stickiness or bacteria growing on surfaces. Simply keep the GermWar Disinfecting Wipes in your bag, desk, car or home to clean up any mess and prevent the cold and flu. Durable, quick drying and biodegradable, GermWar Disinfecting wipes will help keep you and your family healthy and surfaces clean. Product Features...and the benefits you'll experience! Apart from helping to prevent flu transmission, GermWar Disinfecting Wipes (by FluWar) will also be effective at reducing the transmission of viruses that cause the common cold (approximately 200 different viruses). It's the first line of defense when on the go, killing pathogens that can cause stomach flu, skin infections, and other respiratory infection. Shop our complete selection of FluWar.